I made this pair of wrist warmers for a friend. I had made her another pair, in blue, a couple of years ago and recently she told me she wore them a lot and wished she had some in another colour so... I thought cream would go with anything. When they were completed I wondered about decorating them a bit... maybe just a bit of ribbon? Mmmm, yes, but then I thought a nice tatted flower would complete the look. Yes? to the angle of the photo. They really are the same size! Here's a close-up of the lace ribbon decoration with tatted flower. 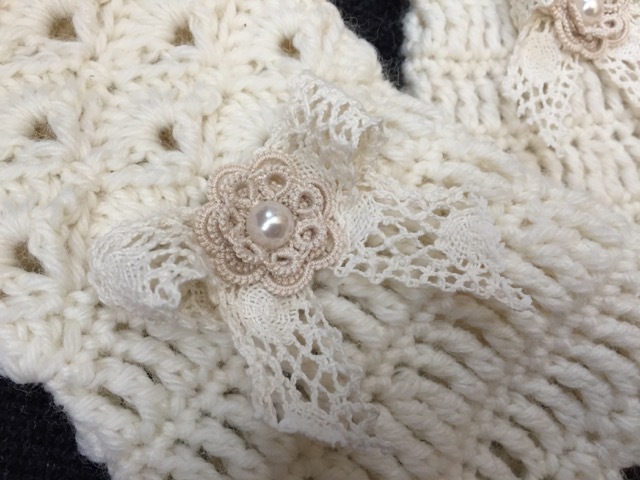 If you knit and crochet, there are loads of free patterns there. Ninetta shared this pattern in December and I've just seen it on her blog. I immediately had to take a break from the previous piece to tat this straight away. I made a bit of a mess with the bugle beads on this, my first attempt; I didn't take them consistently from the same shuttle and therefore sometimes the thread is on one side of the bugle bead and sometimes on the other and I made a couple of mistakes in the centre part. 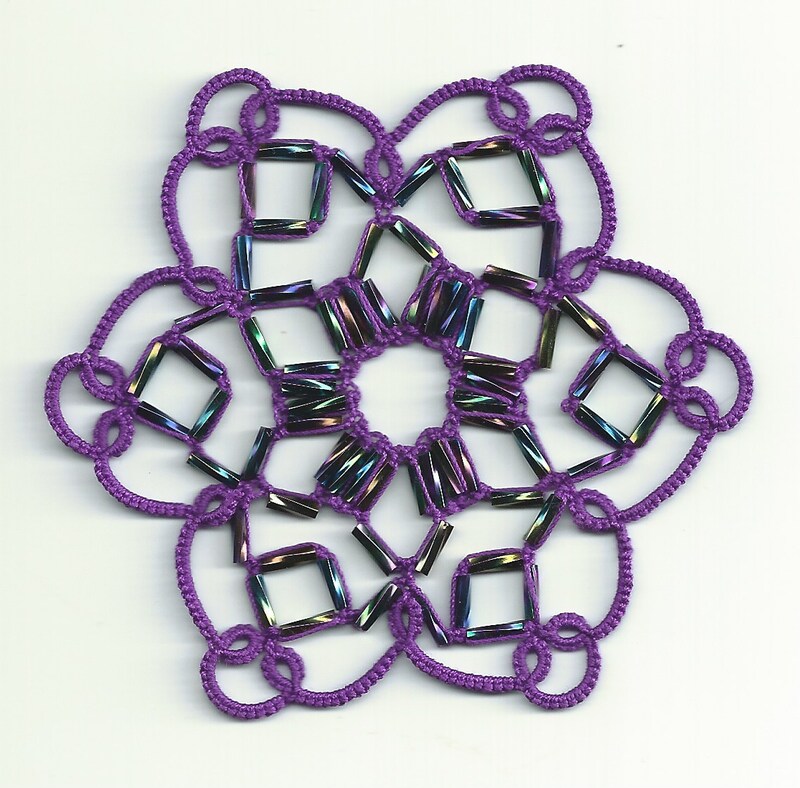 But I really like the idea of block tatting with bugle beads and the diamond shapes too. 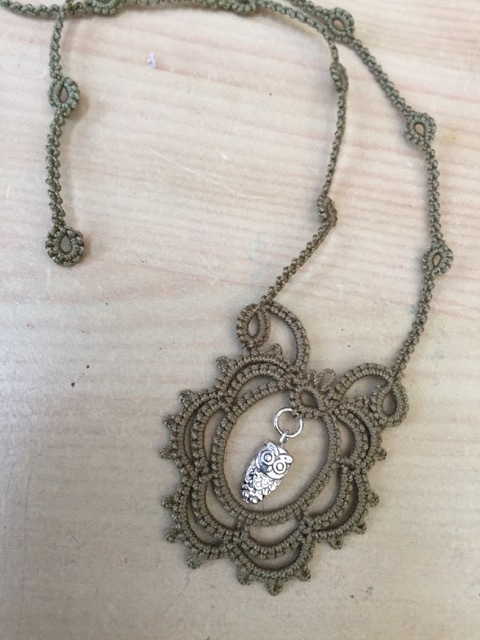 I've not blocked it and so it's not quite symmetrical and I should have taken more time to smooth the curves of the chains before scanning it to do it more justice. 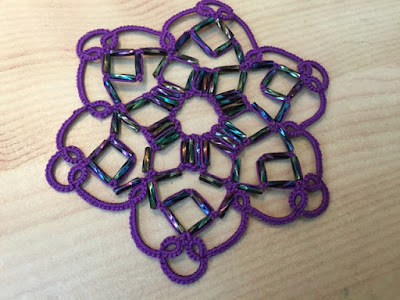 I also found that I had slightly too much tension on the last round and I think I might need a couple more stitches to give the diamonds a bit more room. But that may be because my bugle beads were a tad longer than Ninetta's. I'll try it again with different beads. I also took a photo to try to show the nice colour mix in the bugle beads (copper, purple, blue, green)... like a pool of petrol on the street. Not sure if it's more obvious on the photo below? Pretty cool design - Thank you Ninetta! 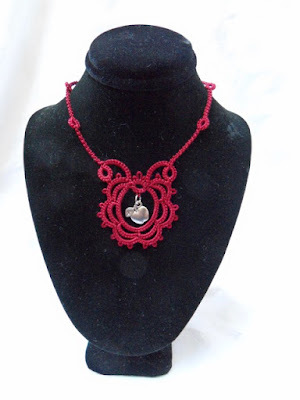 Ninetta is always coming up with new and clever ideas with her designs. Can't wait to see what she'll tat up next! I thought there were some unusual shapes going on in this design but now I've started, I find it a bit too busy! Still, I think I'll complete this one. It will require a small circle of fabric in the middle. Three repeats done, five more to go. 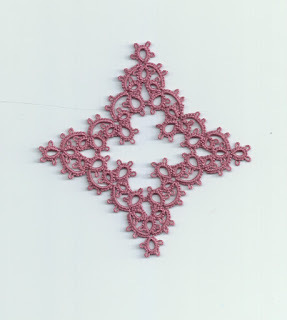 Flicking through my books for inspiration tonight, I decided to tat this diamond motif by Susanne Schwenke from her book "Spitzen-Kreationen". It could be a square too of course but in the book, it is shown as a diamond. 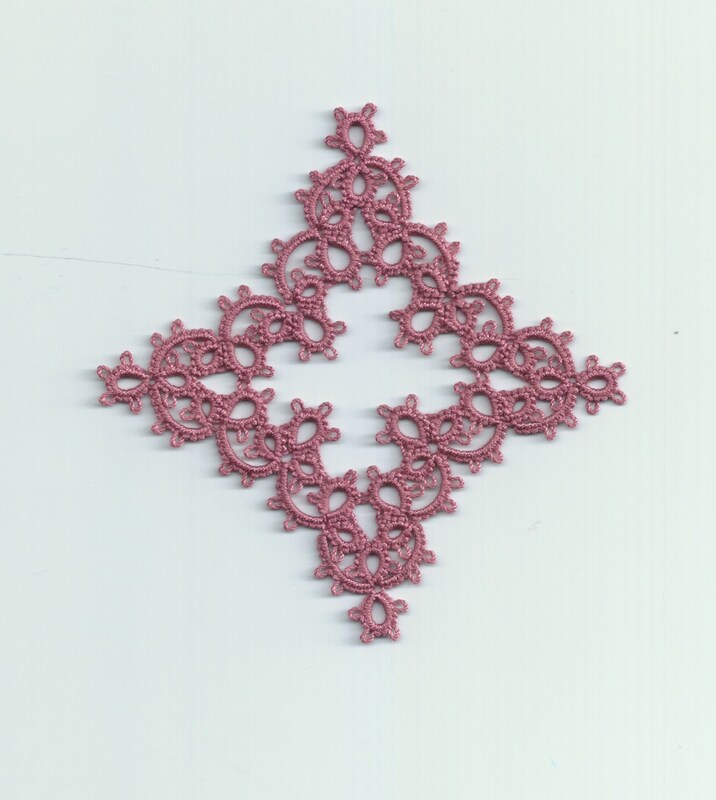 I was thinking of tackling a larger piece made with some of those and slightly smaller ones (as shown in the book) but after tatting this one, I'm not so sure. Oh well. I think I'll try something else. I came up with this design back in 2012. 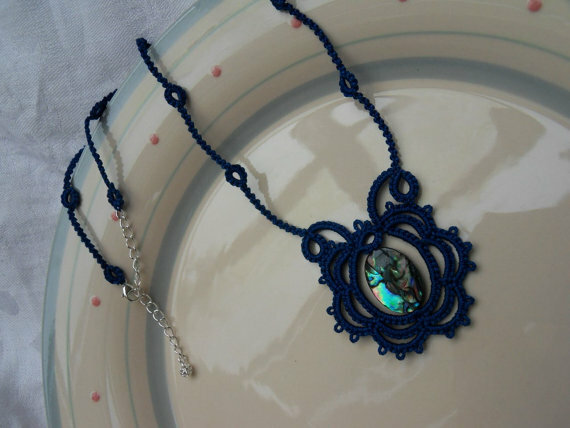 I had some lovely paua shell beads and they inspired me to make a tatted frame for them and this is how this necklace came about. The "frame" can be used to feature different things as you can see in these examples. 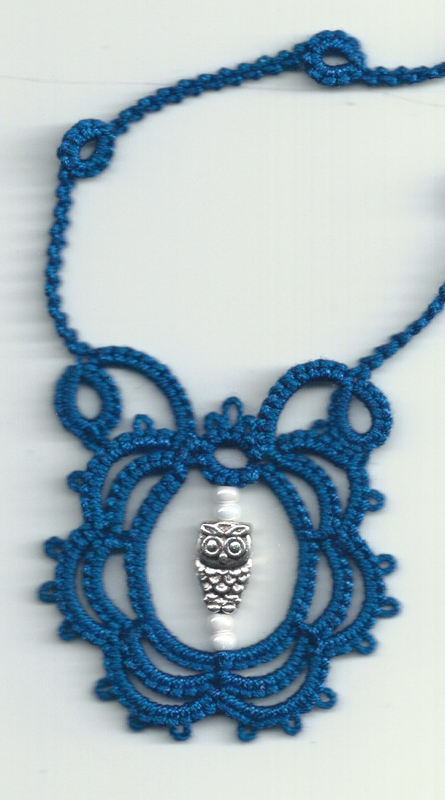 Recently I found some little owl beads and thought they would look pretty in this necklace. beads either side to get the right length. 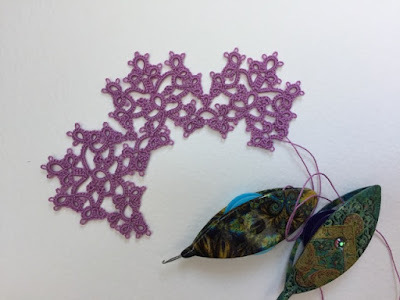 Doing this will let you adapt different size ornaments to fit the design. 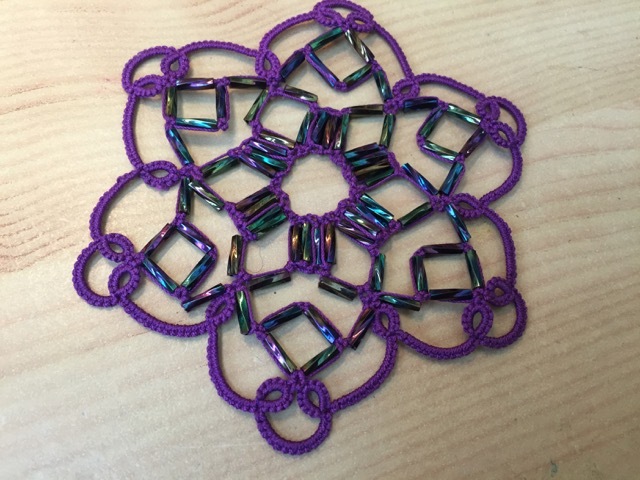 I finally got around to writing a proper pattern for it. I called it "Cameo" as it reminded me of pretty framed cameo necklaces. Ooh, I'm a bit slow to get going this January! 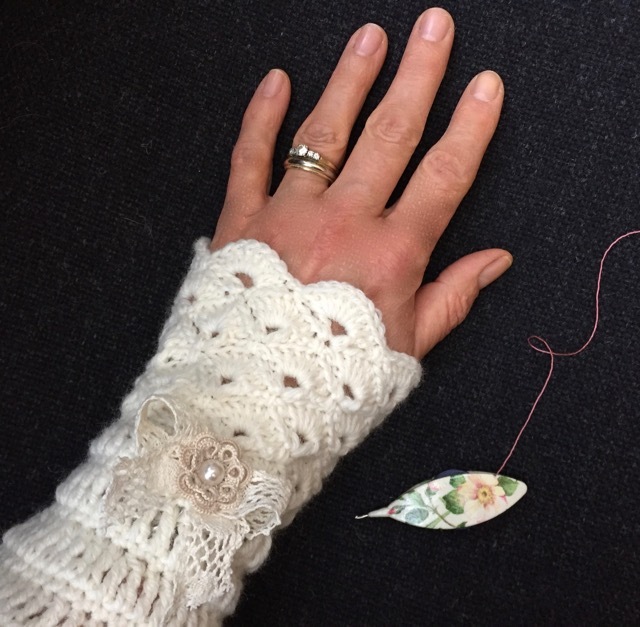 Still no tatting at all but I'm enjoying knitting. For this post, I just wanted to share a culinary delight: not only beautiful to look at but tasty too! I don't know if you remember my attempts at making springerle type biscuits? I had never actually tried the real thing but a kind friend sent me some from Germany (amongst other lovely items too like the pretty crochet doily that the biscuits are on). several were eaten before I thought to take a photo! that was coming through the top of the biscuit. I thought I didn't like the taste of aniseed but I have to say I enjoyed these very much. I have a few left... but they're so beautiful, it's nearly a shame to eat them! Here we are: it's the 1st of January 2017. Another year begins. I wish you all a great New Year filled with exciting projects, happiness and creativity. 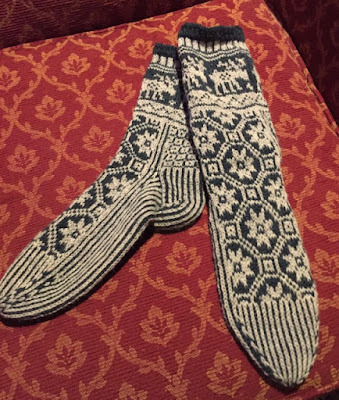 My first completed project is a pair of socks for my daughter - they are "Moose Parade", a free pattern by Drops Design. 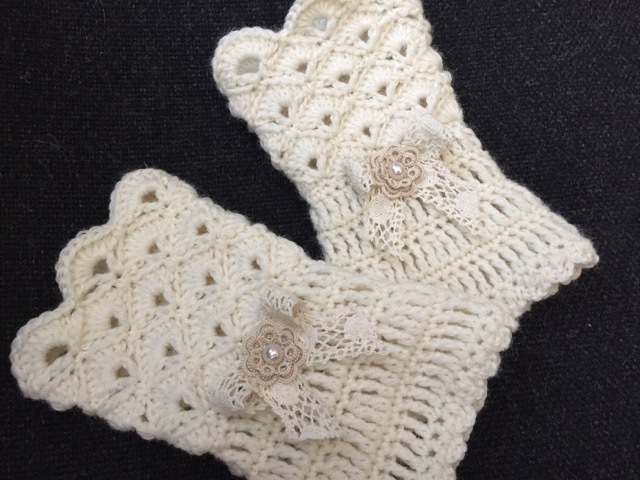 They were meant to be for Christmas but I didn't quite manage to finish them on time. I did complete another pair of red ones with nice cabling which made it under the Christmas tree but this pair took a little longer to knit. I'm pleased with them and would make them again. 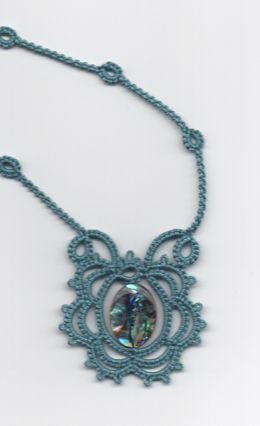 The colour is dark grey-green with a lighter contrasting grey (not really obvious from the photo). The nice thing about colour work on these socks is that it makes for a thicker, warmer sock although it's knitted in fine wool: carrying the wool behind give it double thickness. And the moose were just too cute! How about you, is your new year off to a good start? What are your January projects?